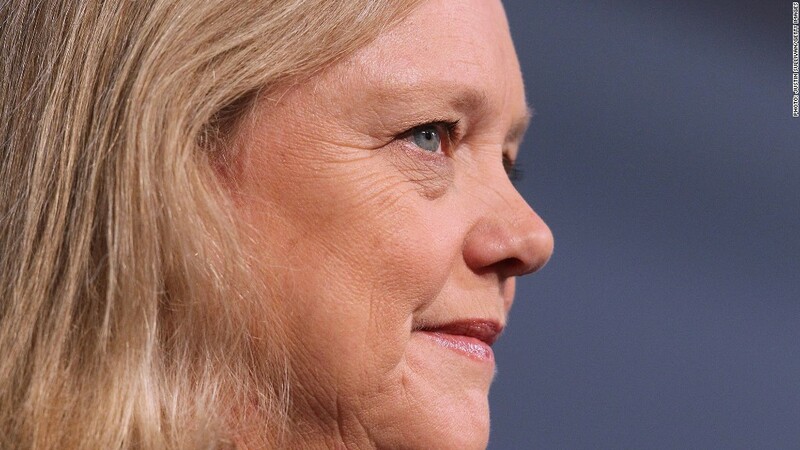 HP CEO Meg Whitman is stressing patience with the company's turnaround. But investors like what they see. Hewlett-Packard is still struggling to turn itself around. But here's the good news for HP and CEO Meg Whitman: When Wall Street estimates are set at rock bottom, they're easy to beat. HP's fiscal second-quarter earnings and revenue both slumped about 10% compared to a year ago, and sales in every individual HP business unit declined. But HP's profit of 87 cents per share was still better than what analysts polled by Thomson Reuters expected. Revenue came in at $27.6 billion, just below estimates, but that wasn't enough to deter investors. Shares of HP (HPQ) soared 13% in after-hours trade on Wednesday following the report. It helped that the company also raised its earnings outlook. For the third quarter, HP expects earnings to come in between 84 and 87 cents per share. That topped expectations from analysts, who were looking for 83 cents a share. Still, Whitman keeps warning that her company's turnaround won't be "linear," and she repeated that in the company's earnings release. "I am encouraged by our performance in the second quarter, and I feel good about the rest of the year," Whitman said. "As I have said many times before, this is a multi-year journey." Whitman, who has been at the helm for nearly two years, is trying to reinvent the PC-centric HP in a tablet and smartphone dominated world. HP has struggled to make major inroads in the mobile market, which is dominated by Apple (AAPL) and Android developer Google (GOOG). On a post-earnings conference call with analysts, Whitman talked a lot about "execution" and admitted that the turnaround is lagging in some areas. But she said she is committed to helping HP "do a better job of managing the transition of the technologies that powered the past to the ones that power the future." Whitman has been aggressive on cost-cutting. The company has plans to eliminate 29,000 jobs by the end of fiscal 2014. Investors appear to believe in Whitman's approach. Despite HP's troubles, the stock is up an incredible 49% year-to-date, making it the best performing Dow component. But as Whitman cuts to improve profits, all of HP's business lines continue to suffer. PC sales fell 20% from a year ago. Revenue from HP's two businesses that cater to so-called enterprise customers (i.e. large corporations) declined about 10% each, led by big drops in sales of servers and storage.